The House is standardizing on a Drupal platform for members' and committees' sites. Details here. Drupal 7 is released. Not a beta, not a release candidate, but released. Click the Get Started link at the left of most pages on this site or go to http://drupal.org/start. 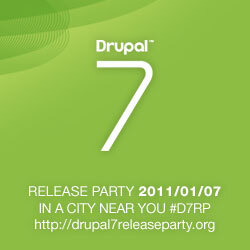 Last Wednesday, RC1 of Drupal 7 was released. I wrote about the early version in Sams Teach Yourself Drupal in 24 Hours, and I'm happy to report that the released version is even better. The two biggest goals of D7 (in my opinion, of course), were internal structural changed including moving CCK fields to Core and improving the user experience -- "user" in this case means site developers, not end-users who visit the site. Module pages (including download links) for the modules discussed in Sams Teach Yourself Drupal in 24 Hours by Jesse Feiler.